Show Water Quality Internship | K.O.I. The ability to mix and use standard solution for Ammonia testing. The ability to professionally handle unexpected circumstances, e.g., stressed fish, O2 deficit, injury, inadequate fasting, spawning, high heat and fluctuating temps, too many Koi in a tank, electric shock, loss air, owners requests to remove Koi early. Understanding of the role and authority of the water quality manager. Understanding of decisions to be deferred to the proper authority. Awareness of what WQM should do in advance of the show. How to do pre-show testing of source water and plan for treatments and amendments. The ability to properly use water treatment chemicals and prepare appropriate schedules for use. The ability to make health assessments of sick or injured Koi. The ability to deal with fouled tanks and take corrective action. The ability to monitor and correct breaches in bio-security. The ability to properly empty, sterilize, dry, and prepare tanks for storage. The ability to prepare and control the use of spare show tanks. The ability to professionally handle conflicts of authority. Working knowledge of Koi health and safety rules for exhibitors. The ability to calculate tank stocking limits, and the ability to deal with overstocked tanks. The understanding of proper transport techniques. The ability to design and install an air distribution system, with proper backup. The ability set up and prepare tanks and splash shields before the Koi arrive. The ability to prepare and use disinfectant and adequately rinse tanks. Understanding of the pre-show training syllabus and be able to deliver that training. The ability to effectively use signage and barriers. The skills required of the WQM during the time that Koi are arriving at the show, including bio-security issues, transport problems, disposal of bag water, etc . The skills required of the WQM during benching and judging, including bio-security risks, stressed Koi, etc. The ability to test water at the show (ammonia, pH, D.O., temp, ammonia margin, testing test kits) and observe water quality (clarity and precipitates) during the show and take any necessary corrective action. The ability to keep water testing records, and methods for assuring chemical treatments. The ability to control the show ring after the show while Koi are leaving. Knowledge of Koi safety relating to handling during the show, bagging to go home, night checks and security, and proper tank netting. All students will need an email address and internet access to K.O.I. websites. NOTICE. This course is ONLY available as part of the Show Water Quality Specialist Certification program. Students applying for the Show Water Quality Internship must have already passed the other four courses required to become a K.O.I. Show Water Quality Specialist. The purpose of the Internship is to give instructors an opportunity to access the student’s knowledge by observing their ability to apply their knowledge in real-life situation. The student will be under the tutelage and guidance of a qualified Instructor. The students pretend they are in charge of the Water Quality for the show, and do all appropriate water testing to demonstrate their knowledge to the instructor. As part of their simulated job, students will also observe the management of the show and the safety and biosecurity protocols in place. The Student and Instructor may actually run Water Quality at a Koi Show. 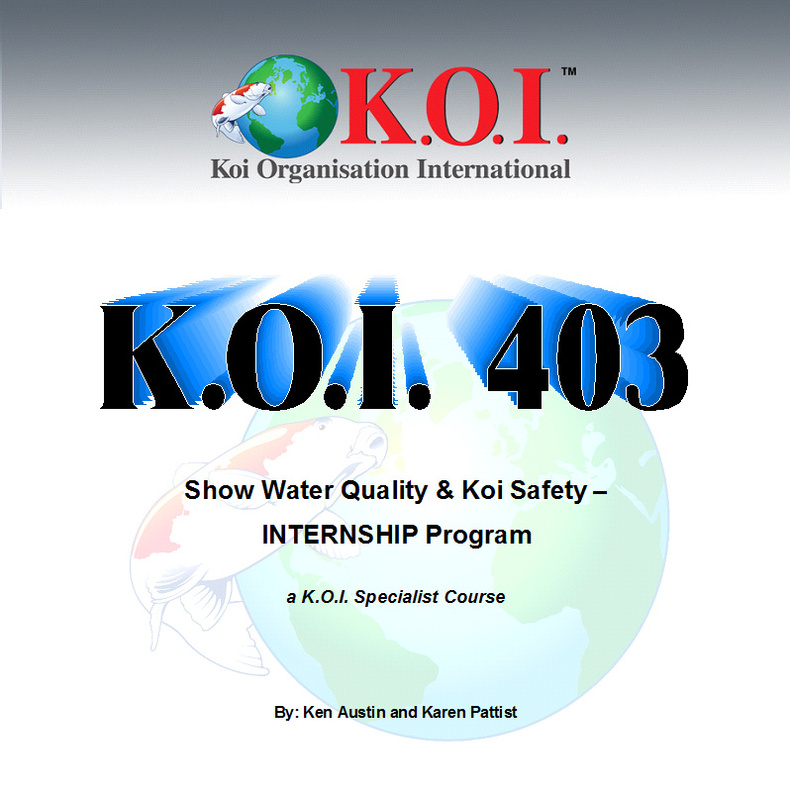 Koi Show chairpersons that would like to request that a Water Quality team be provided by K.O.I. for their show should contact Karen Pattist (pattist@snet.net). The student must bear their own expense for the purpose of the Internship. If the Koi Show has less than 100 Koi entered, an Internship student may be asked to intern at a second Koi Show before becoming Certified. After passing the Internship, the student will achieve Certification as a K.O.I. Koi Show Water Quality Specialist, and will have demonstrated the capacity to be solely responsibility for the water quality at Koi shows. A Certified Instructor will be matched to the student for the purpose of the Internship. The Intern must be judged by the Instructor to be proficient in all areas in order to pass the course. If that cannot be accomplished in a single show, then the student will be asked to continue their Internship at another show. The Intern must be judged by the Instructor to be proficient in all areas in order to pass the course. If that cannot be accomplished in a single show, then the student will be asked to continue their Internship at another show, and a new deadline will be determined. 2. KOI Student Coordinator will send you an email regarding the Internship. 3. An Instructor will send you an email regarding the Internship requesting you to determine the Koi Show and date you prefer for Internship training. 4. Respond to the Instructor’s email.